Once the snow has disappeared, the ice melted in your pond and the temperatures have been consistently above 40°F for a week or more, it’s time to open up your pond for the spring. Below are 12 steps to lead you through the clean-up process. Step 1. Rake up and dispose of leaves in the area surrounding your pond and remove the pond netting used to prevent the leaves from entering the pond. Step 2. Use a skimmer net or pond vacuum to remove debris from the pond. A long handled brush is also helpful in removing string algae. Step 3. Clean up your water plants, cutting back dead debris and bringing pots that were placed in deeper levels over winter to their proper location. If water plants are overgrown, spring is an excellent time to divide and repot, with the exception of early blooming plants such as Irises. Aquatic pots, planting soil and fertilizer will be needed to repot existing plants. Begin fertilizing aquatic plants in late April or early May. Step 4a. 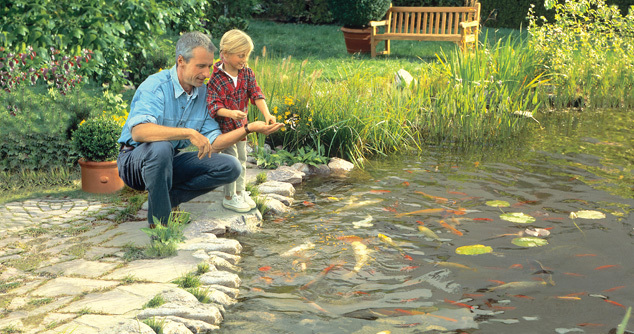 If your pond has minimal debris and sludge buildup, perform a 25% water change. Note: Before adding new water, be sure to add EasyPro Water Conditioner that will remove chlorine and breaks down chloramine from city water and detoxify heavy metals in well water. EasyPro Water Conditioner Plus also removes chlorine and breaks down chloramine but also helps your fish by adding essential electrolytes, replacing the fish’s slime coat and reducing fish stress. Step 4b. If your pond has significant sludge and debris (1″ or more) after the initial skimming and vacuuming, you should perform a complete water change. • Prior to performing a complete water change set up a temporary tank for your fish using water from the ponds surface (do not pull water from the sludge laden bottom that may contain significant toxic gases). Add an aerator or pump to the tank to add oxygen to the water. The tank should be set in the shade and covered to prevent the fish from jumping out and predators from getting in. Do not feed the fish while they are in the temporary tank. Prior to returning the fish to the newly cleaned pond add EasyPro Water Conditioner. Also, if the temperature of the new pond water is more than 2ºF different than that of temporary tank, the fish should be placed in plastic bags with water from the temporary tank and floated in the pond for 10 to 30 minutes prior to release. The floating time will vary based on the temperature difference: if the difference is 5ºF or more, replace 25% of the water in the bag with pond water every 10 minutes until the temperature of the bag water is within 2ºF of the pond water. When releasing the fish into the pond, carefully net the fish out of the bag and dispose of the bag water on the ground. • When cleaning the sludge from the pond bottom a pond vacuum can be very helpful. Be sure to set the vacuum outside the pond for easy emptying. Step 5. Reconnect your pump and filter. If the filter or skimmer pads were not cleaned in the fall, they should be rinsed prior to restarting your pump. Do not over clean your filter pads or use any form of soap, or bleach on the pads. If pads are badly worn or torn they should be replaced. If new pads need to be purchased, consider upgrading to new “Matala” pads. Matala pads are easier to clean and last longer than traditional pad material. Step 6. Test your water quality using an at home pond test kit. The Ammonia and Nitrites levels should read zero. If higher than zero, an additional 25% water change should be done until the levels are reduced. pH should be between 6.5 and 8.5. If the pH is outside this range add EasyPro pH Up or EasyPro pH Down according to the directions on the bottle. If you have fish in your pond, the salinity should be between .1% and .25%. To achieve a salinity of .1% (assuming your current salinity is 0%) add one pound of EasyPro Pond Salt per hundred gallons of water. Pond salt is 100% pure salt, contains no additives and is in large crystal form for slow release. Step 7. Add EasyPro All Season Liquid Bacteria or Seasonal Boost bacteria to breakdown remaining sludge and re-colonize beneficial bacteria in your bio-filter; add EasyPro Barley Straw Extract to help keep your pond water clean and clear. Step 8. If you have an Ultraviolet (UV) Light Clarifier or Sterilizer to prevent green water, replace the lamp and clean the quartz sleeve that covers the lamp. However, do not turn the UV unit on until the new bacteria have had 48 hours to colonize. Step 9. Prepare for the return of the heron by placing fishing line around the edge of your pond, netting the pond or installing a motion detection device such as a ScareCrow to scare away predators. Step 10. Feeding fish can begin when water temperatures remain above 40°F with a wheat germ food such as EasyPro Cold Water Koi & Goldfish Food. This low protein diet is easily digestible by fish during colder water temperatures. Use a pond thermometer to test the water’s temperature. 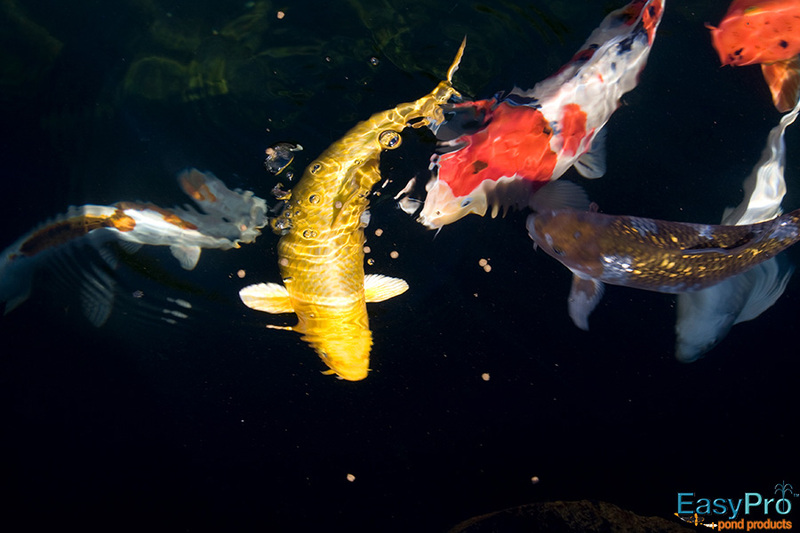 From 50°F to 65°F, feed fish once weekly and at 65°F and above, feed fish every other day with EasyPro Max Color Koi & Goldfish Food (5mm pellet) or EasyPro Max Growth and Color Koi & Goldfish Food (3mm pellet). These staple foods contain stabilized vitamin C and immune stimulants for optimum fish health as well as spirulina and other natural marine ingredients for color enhancement. Step 11. To keep your pond clear and healthy, and to breakdown sludge and debris throughout the season add EasyPro All Season Liquid Bacteria and EasyPro Barley Straw Extract on a regular basis. The use of EasyPro Sludge Remover Bacteria as directed will help to break down leaves, fish waste and other organic debris along the pond bottom. If your pond has green or brown water add EasyPro Water Clarifier to quickly clear up murky water caused by floating dead organic and inorganic particles by pulling these floating particles together and settling them to the bottom. Step 12. Enjoy the beauty and tranquility your pond brings you each day!